KSW Credit Union has you in mind with every transaction you make. We know you love to shop! And now you can do so with peace of mind. We’ve added security to our Visa cards to make your information more secure than ever before. KSW uses EMV chip cards with the latest microchip technology. The embedded microchip on our card contains encrypted information required to authenticate transactions. Chip cards are the most advanced and secure technology for point of sales transactions and are used worldwide. 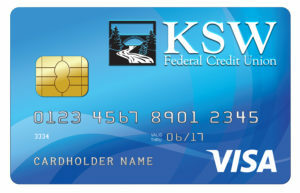 Why apply for a KSW FCU Visa ScoreCard Credit Card? Paying your monthly Visa Credit Card payment has never been easier! With EZ Card Info, members can check balances, search transactions, and make payments! Coming Soon: EZ Card Info Mobile! Perform all EZ Card Info transactions right from your tablet or smartphone! Credit Insurance is affordable and sensible, but most of all easy to apply for! Stumped on what to get for Christmas gifts this year? No problem! KSW offers Visa Gift Cards for any occasion! Stop in and pick yours up today! Every card is loaded at the time of purchase, and the funds are instantly available! Lost/stolen replacement card $5.00. Visa Gift Cards are issued by Metabank®, Member FDIC, pursuant to a license from Visa U.S.A. Inc.
* Monthly inactivity fee of $2.95 after 12 consecutive months of inactivity. Visa travel cards are reloadable and multipurposed cards. The smart, secure way to travel. NO hassels with travelers checks, just load and go! * Other fees may apply, see terms and conditions for details. Third party fees may apply.